The bird life of Guyana includes at least 783 species. 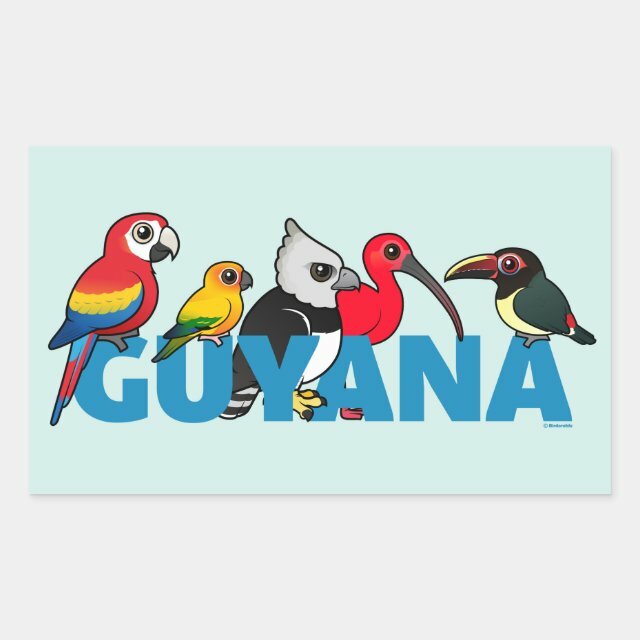 This fun Guyana design features five target bird species that people like to see when they visit this amazing South American country. This design features our cute cartoon version of these five special Guyanan birds along with the country name in bold blue text. The birds are: Scarlet Macaw; Sun Parakeet; Harpy Eagle; Scarlet Ibis; and Green Aracari. You can customize this gift! Move the design around, change the product background color or product style, or even the product type! Make it your own! Our rectangle sticker is measures 4.5 by 2.7 inches (4 per sheet). These stickers are great for labeling your stuff, scrapbooking, sealing envelopes or just plain fun. They are easy to peel-and-stick anywhere and have vibrant colors printed on scratch-resistant paper! Who are you calling Harpy?